7 costly mistakes to avoid when choosing a new POS system for your retail business. so you want to make sure you get it right. Here are 7 mistakes to avoid at all costs. Rigid, long-term contracts (most of which require payment up front) can put you in a bind if a solution turns out to be a poor fit for your business. Not to mention: today’s retail environment requires merchants to adapt to changes quickly, and having an ironclad contract could curb agility and growth. “We met with vendors whose systems entailed a fair amount of training, limited features, and substantial upfront costs in excess of £5000 for clunky equipment. After a recommendation, we met with Vend and were relieved to see it just needed an iPad and a reasonably priced printer, cash drawer, and scanner. Migrating customer and inventory data can be a pain if you don’t do it right, so it’s important to plan how you’re going to transfer information from one system to the next. Will you enter the data manually or import it in bulk? What are the import and export processes for the two systems? Failing to iron out these details could result in a time-consuming — and expensive — migration process. Allocate ample time and staffing resources for the migration process. Be sure to clean up and organize your store data, and correctly format the data or files before importing them into your new system. Try migrating a few products or customers first. This’ll give you an idea of what the process entails so you can plan accordingly. It’s fine to go for a cost-effective POS, but make sure you aren’t compromising important features in the process. A new POS system requires a sizeable investment — so you want a keeper, not something you’ll need to replace in a few years. Unfortunately, that’s exactly what could happen if you choose a POS that addresses your immediate requirements but not your long-term or potential needs. Don’t be short-sighted. Choose a solution that can keep up with your growth and future plans. Think about where you want your business to go, then make sure your new solution aligns with your goals. Start by listing the capabilities you have now and the features you need going forward. Taking this step will make your search for a new POS a lot easier, and you won’t have to waste energy on systems that aren’t a good fit for your business. Unless you’re planning to replace all your retail hardware and software, you should take the time to check if a POS system is compatible with your existing equipment and programs. The last thing you want is to purchase a new system only to find that it doesn’t work with the technologies you already have. Make a list of your existing hardware and software, and determine if they’ll work with your new POS. If they can’t be integrated, consult your provider on your options. Do you need to replace your existing technologies? What’s the cost of doing so? Get the answers to these questions before committing to a solution. Licensing or subscription fees aren’t the only costs that come with a new POS. You also need to factor in costs for maintenance, training, and payment processing, among other things. If you fail to account for these expenses, you could end up paying more than what you originally planned. There’s more to a POS solution than specs, features, and capabilities. Things like customer support, thought leadership, and integration partners all contribute to your experience with the vendor, so take the time to evaluate these components. If you neglect them and focus solely on the technical features of a solution, you could miss out on other great companies — or worse, get stuck with a vendor that isn’t completely invested your success. Go beyond the technical offerings of a POS vendor, and evaluate its customer support and success offerings, educational initiatives, and even corporate culture. The right vendor won’t just offer a great solution; ideally, it’ll also provide you with the support and resources you need to improve your retail business — and that can pay off in dividends in the long run. There you have it! The top 7 costly mistakes to avoid when choosing a new POS system. Take the guesswork out of choosing your next POS. 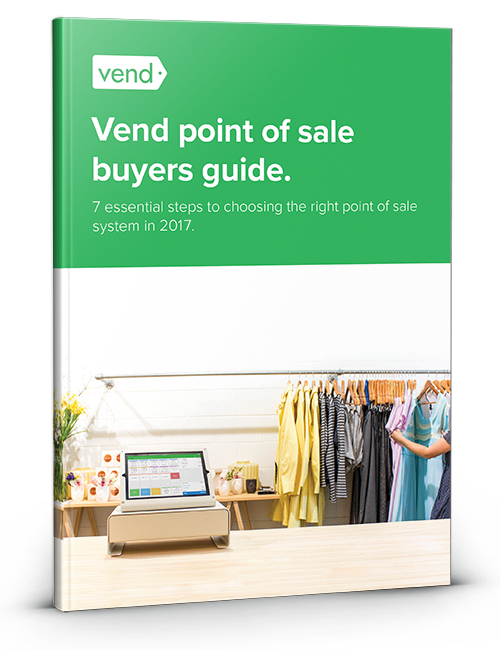 Join thousands of retailers who have downloaded a copy of Vend’s POS Buyers Guide. Written by several of the world’s leading retail experts, this guide will ensure you don’t suffer from buyer’s remorse in six months time. Or alternatively, request a call back from one of our retail specialists.